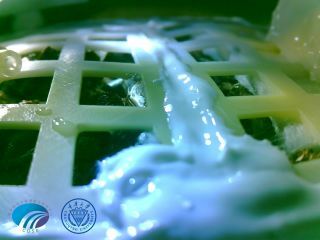 Chinese scientists released this image of a cotton plant germinating in its tank on the moon aboard the Chang'e 4 lander. The photograph was taken Jan. 7, 2019. Before China finished packing up its Chang'e 4 lunar lander to be blasted off on a never-before-accomplished journey to the far side of the moon, scientists slipped in a small tank holding plant seeds. And now, the team announced, a cotton seed has sprouted. That makes it the first truly otherworldly plant in history. Astronauts onboard the International Space Station regularly tend plants to study how growth changes in microgravity (and to diversify astronaut diets in space), and plants and seeds have orbited Earth on and off throughout spaceflight history. But the closest that terrestrial vegetation has come to the moon before now was in 1971, when Apollo 14 astronaut Stuart Roosa carried hundreds of tree seeds to orbit the moon with him. Many of these seeds were later planted back on Earth, becoming "Moon Trees." In addition to cotton, the Chinese moon capsule also includes seeds to grow potatoes and a common lab plant called Arabidopsis, neither of which have sprouted so far. And even the cotton plant is looking pretty peaky compared to seedlings in a control setup the scientists established on Earth. An image of the Chinese biology experimental capsule now on the far side of the moon aboard the Chang'e 4 lander. It's not particularly surprising that the moon seeds are struggling, since they've been through a lot — the drama of launch, uncomfortable temperature swings, low gravity and high radiation. The capsule and its seeds are stored on the Chang'e 4 lander, which is perched inside Von Kármán Crater on the far side of the moon. The lander is accompanied by the Yutu 2 rover, which has left its grounded counterpart to explore the neighborhood. Both robots are currently experiencing their first long, cold night on the moon, when daytime and nighttime each last about two Earth weeks.